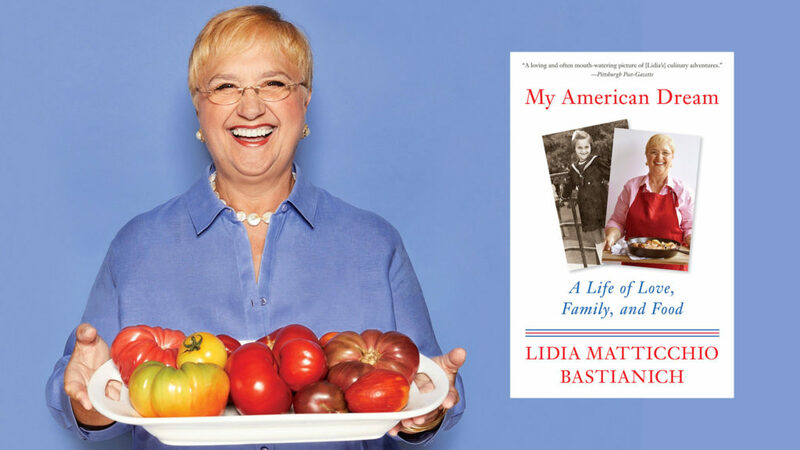 The bestselling cookbook author, beloved and award-winning television personality, and hugely successful restaurateur, Lidia Bastianich comes to town to share her heartwarming, emotional, revelatory memoir—told with all her hallmark warmth and gusto. Leave with her favorite recipes in hand! Lidia’s story begins with her upbringing in Pula, a formerly Italian city turned Yugoslavian under Tito’s communist regime. She enjoys a childhood surrounded by love and security—despite the family’s poverty—learning everything about Italian cooking from her beloved grandmother, Nonna Rosa. When the communist regime begins investigating the family, they flee to Trieste, Italy, where they spend two years in a refugee camp waiting for visas to enter the United States–an experience that will shape Lidia for the rest of her life. At age 12, Lidia starts a new life in New York. She soon begins working in restaurants as a young teenager, the first step toward the creation of her own American dream. And she tells in great, vivid detail the fulfillment of that dream: her close-knit family, her dedication and endless passion for food that ultimately leads to multiple restaurants, many cookbooks, and twenty years on public television as the host of her own cooking show. An absolute must-have/must-see for the millions of Lidia fans! For each 1-2 tickets sold, the purchase of a book voucher (My American Dream, $17 paperback) is required. Vouchers can be redeemed on the event night for signed copies.